This shop has been compensated by Collective Bias, Inc. and its advertiser. All opinions are mine alone. 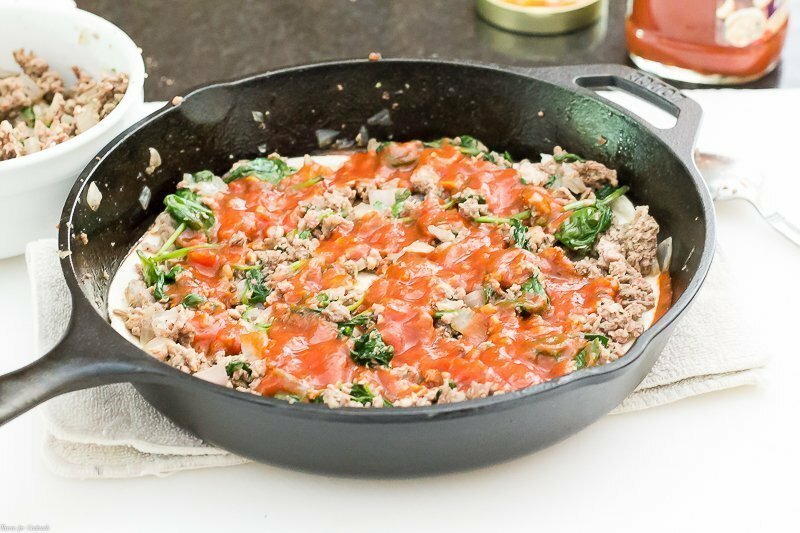 #ScrubDishCloth #CollectiveBias This Italian Enchilada Skillet is a comfort food fusion in one convenient skillet. Ground beef, Italian sausage and spinach layered between tortillas with tons of melty cheese and marinara sauce in a cast iron skillet. 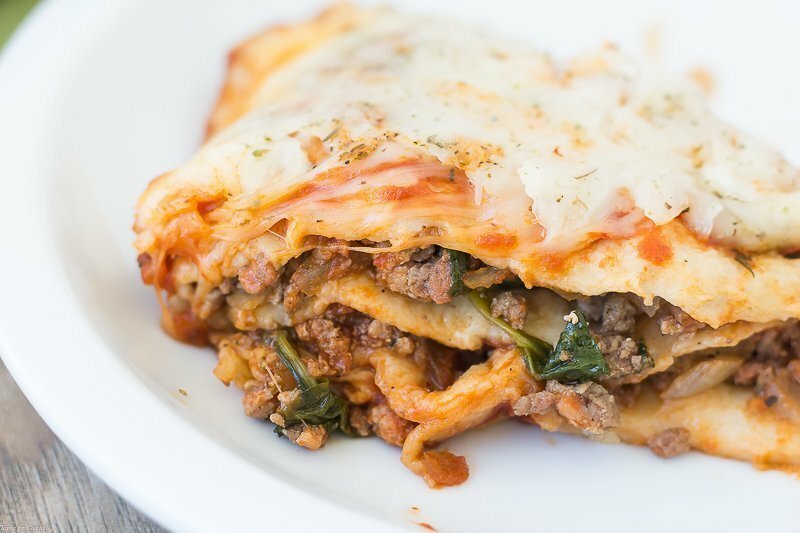 One day a handsome enchilada was walking down the street and passed a pretty slice of lasagna. He took one look and they fell in love. They were from different worlds but it didn’t matter. 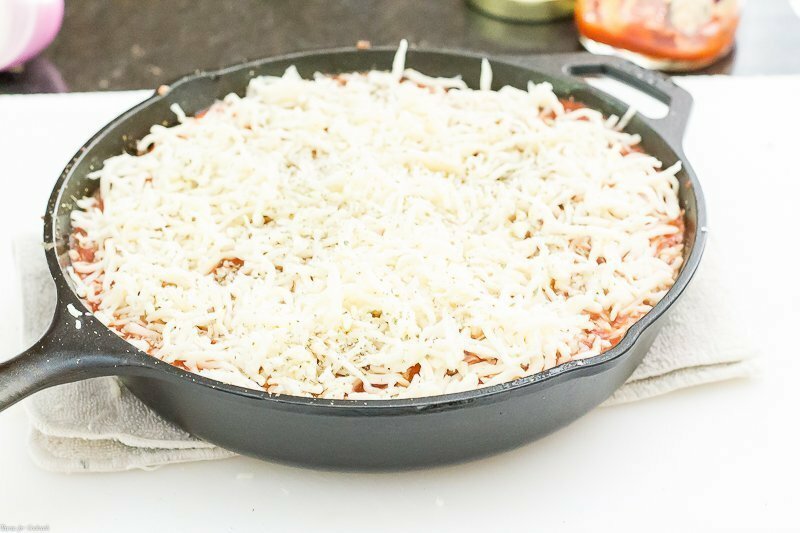 They found a nice cozy cast iron skillet and built a cheesy, messy, delicious life together. 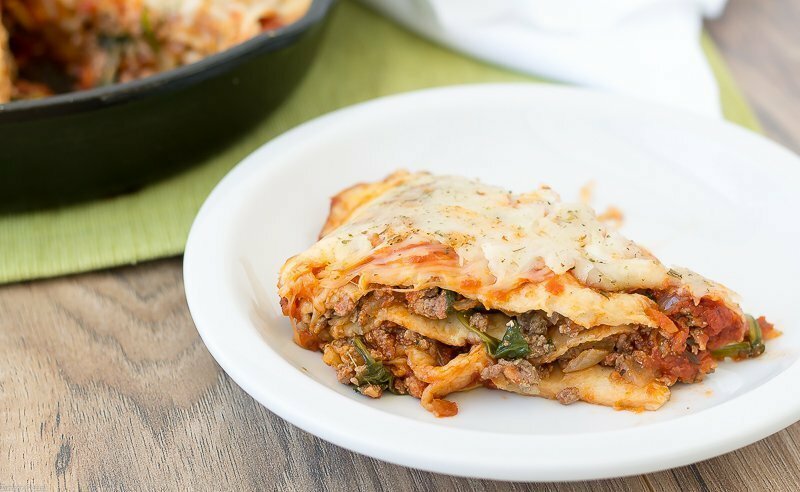 [bctt tweet=”Italian Enchilada Skillet #castironcooking #skilletmeals ” username=”thyme4cocktails”] It was a romantic fusion of two cultures just like Paul and I… Pretty cute, huh? I guess I am being exceptionally dorky because today is our anniversary. Yep, it’s been 2 years since we snuck off to Vegas and tied the knot. 2 years of ups and downs, of starting over, then starting over again and finally finding a little balance. The blog has changed tremendously, Paul’s business is growing and the kid has one foot out the door. We are a long way from where we started and it’s only going to get better! With everything we juggle on a daily basis, up at 3am work then work until we drop 6 days a week, dinner needs to be delicious and easy. But sometimes delicious is also super messy. You folks know I love my cast iron skillet. 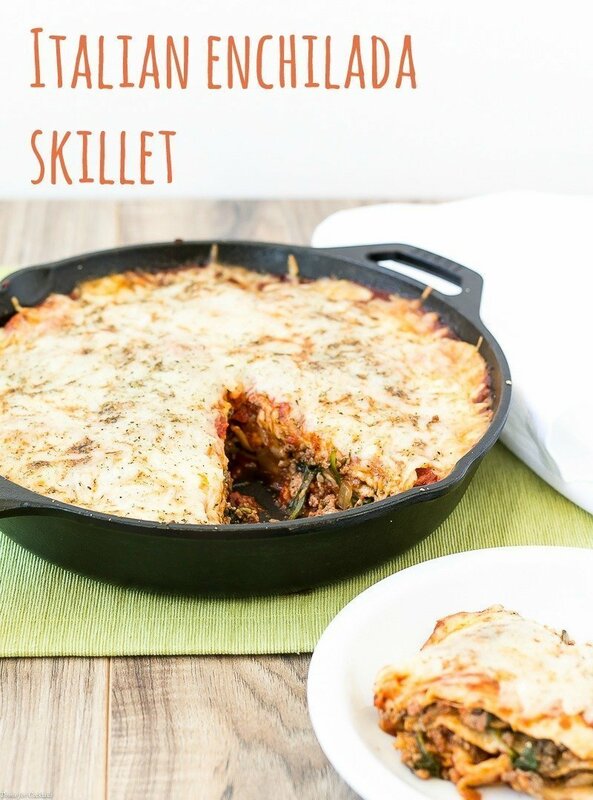 Skillet meals are my go-to for easy, one-pan meals. 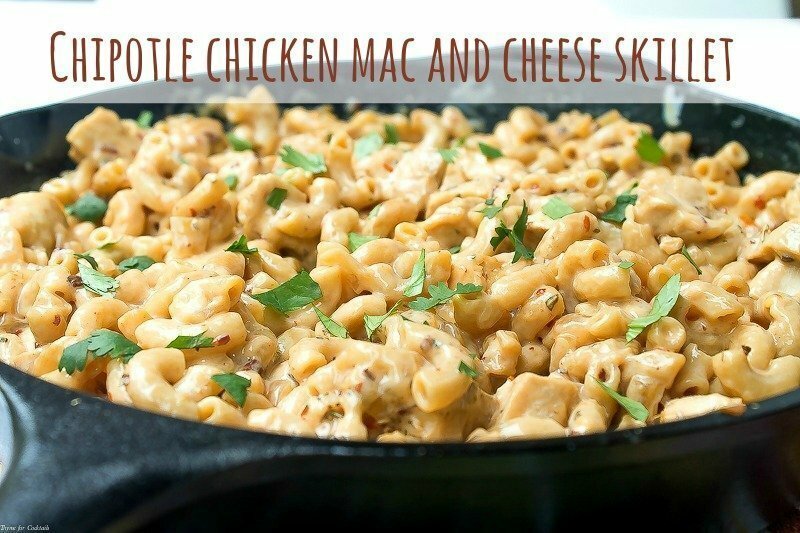 Remember the Chipotle Chicken Mac and Cheese Skillet? Well the number one rule when caring for your cast iron cookware is NOT to wash it with soap and water! 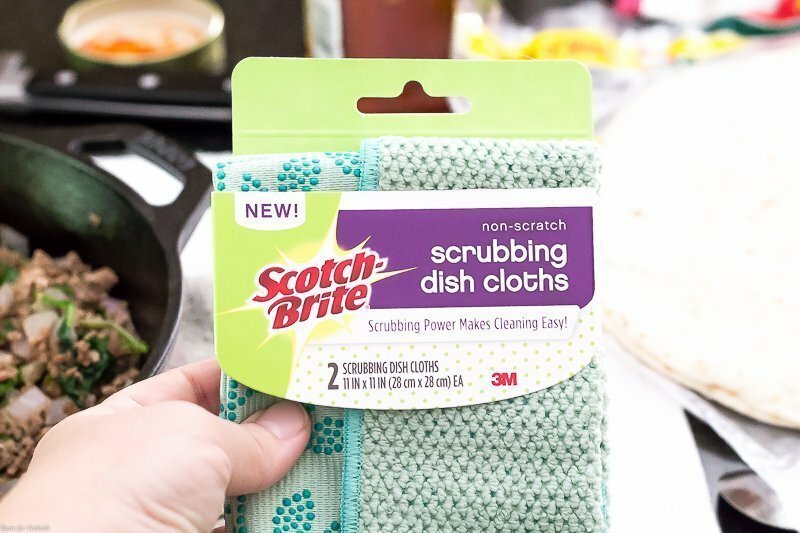 The new Scotch-Brite® Scrubbing Dish Cloth gives you non-scratch scrubbing power with the wiping and drying functions of a dish cloth and is perfect for cleaning your cast iron cookware. Scotch-Brite® Scrubbing Dish Cloths are fully washable, reusable and sturdy. I love that it gets all the stuck-on bits out of my cast iron skillet. I keep one set of dish cloths specifically for cleanings those pans. 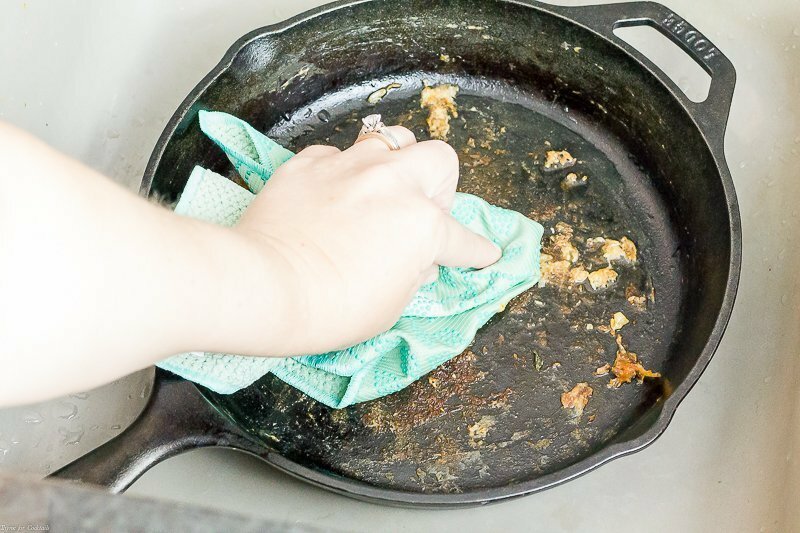 Be sure to grab this printable with more tips for cleaning cast iron cookware! Dish cloths are available in 2 packs in gray, mint, coral, and navy for $4.99 at Target in the kitchen tool area. 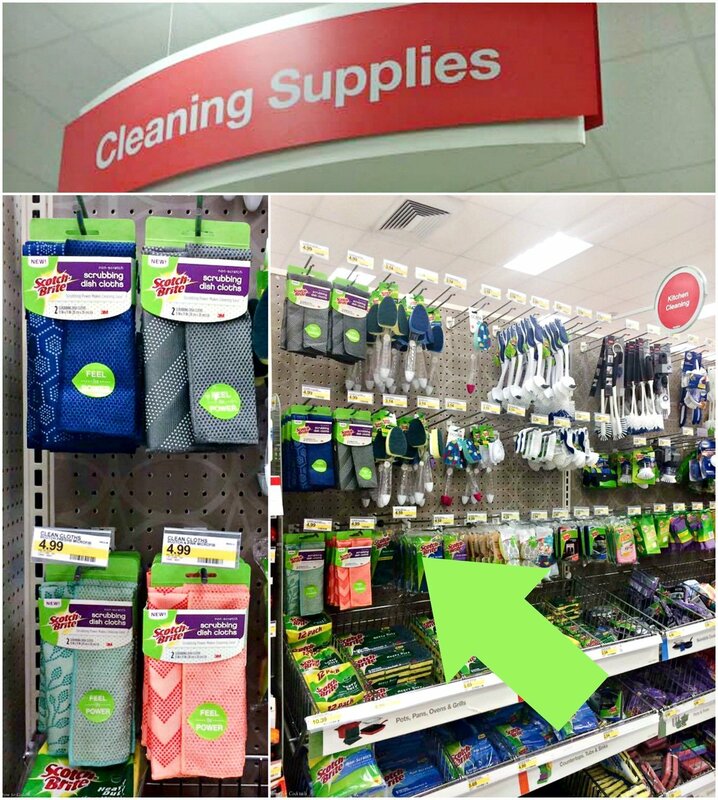 Save now on Scotch-Brite® Scrubbing Dish Cloths at Target with this Cartwheel offer available from 6/19-6/25. 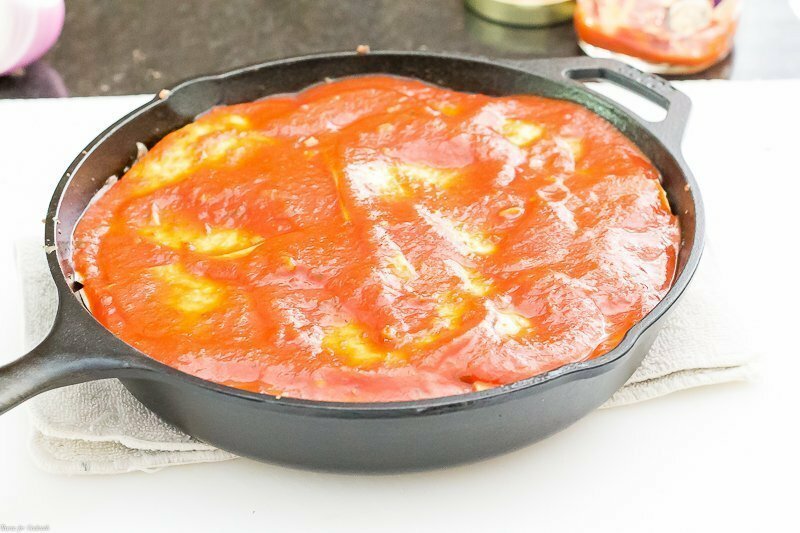 What I love most about this Italian Enchilada Skillet are the layers! 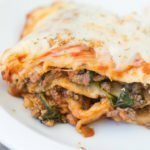 Lasagna has layers of pasta. Enchiladas are made with tortillas. And you know how we feel about tortillas! lol You start by making the filling in the pan on the stove. 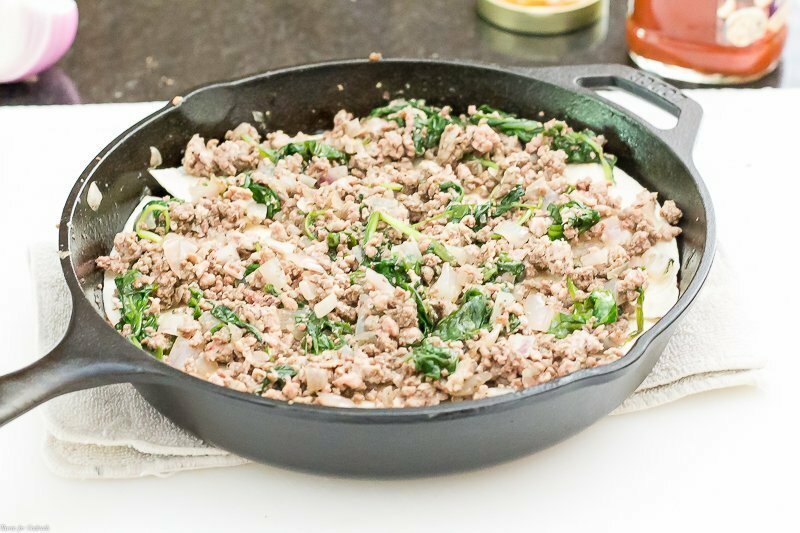 Ground beef, sweet Italian sausage, fresh spinach and diced onions. Be sure to salt and pepper the mixture. Scoop it all into a bowl and set aside. 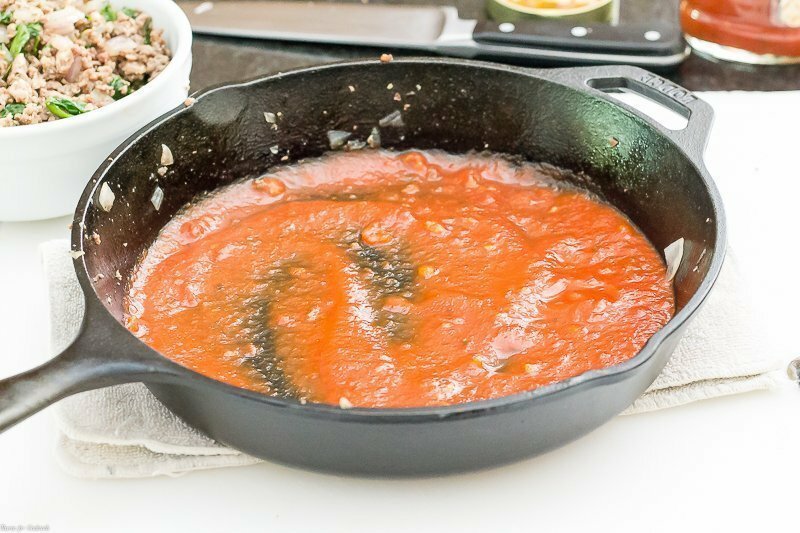 Start with a layer of marinara sauce in the bottom of your skillet. I used a simple jarred sauce from Target. Then put down a layer of tortilla. Find ones that fit your skillet perfectly or cut them down to size like I did. You just want to make sure it covers the whole area. Top with half the filling and more sauce. 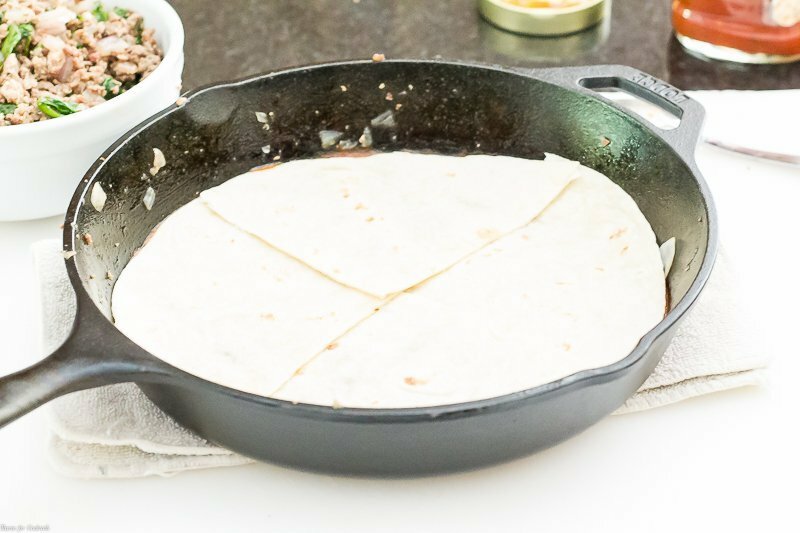 Then go for another layer of tortillas and the remaining filling. And don’t forget more sauce. And lots of cheese!! I also gave the top a sprinkling of dried Italian seasonings. Needless to say this Italian Enchilada Skillet didn’t last long. We had a family friend over for dinner and the guys destroyed every last bite. 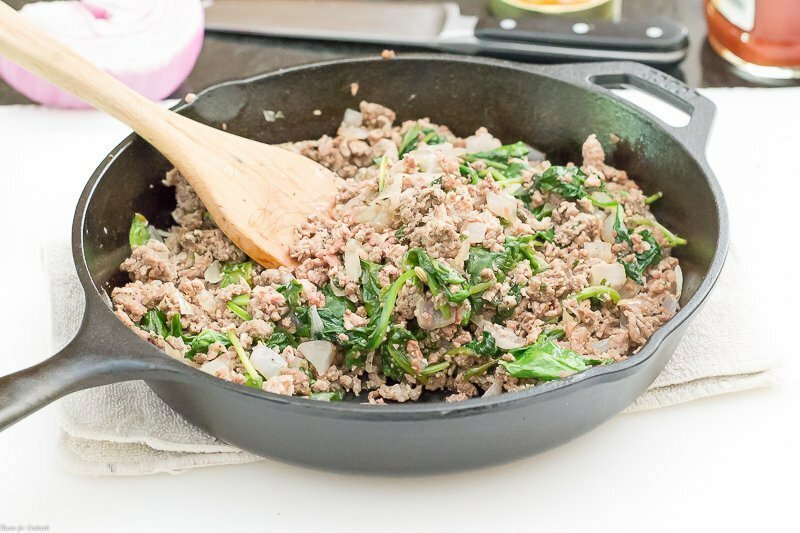 This Italian Enchilada Skillet is a comfort food fusion in one convenient skillet. Ground beef, Italian sausage and spinach layered between tortillas with tons of melty cheese and marinara sauce in a cast iron skillet. Heat a 10-inch cast iron skillet over medium heat. Add ground beef and sausage. Break up and cook 3-4 minutes. Add onions, cook 2-3 more minutes. Stir in spinach, cook 2-3 minutes until wilted. Salt and pepper to taste. Remove filling, place in a bowl and set aside. Spoon a thin layer of sauce into bottom of skillet. Place 1 tortilla over sauce. Cut to fit if necessary. Spread half of filling over tortilla, top with more sauce. Repeat another layer of tortilla, remaining filing and more sauce. Top with final layer of tortillas and remaining sauce. Sprinkle with grated cheese and Italian seasonings. Bake 25-30 minutes until browned and bubbly. Let rest 5-7 minutes to set before serving. Irene, did you sign up on the website? You can input your email address there!